Step 3. Click on “Plans"
Step 4. Choose “Available plans”. Then click on "Data Plans". Step 5. You will receive an overview of the available plans, of which you can select one. Confirm the activation of the plan, click on "Activate". Wait a few minutes for a conformation message. It is also possible to click from your home screen on "Plans". 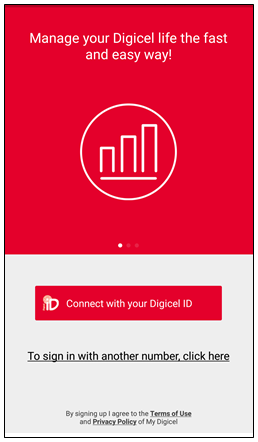 Here you will also receive an overview of all the available plans for the number for which you are logged in in the My Digicel App.